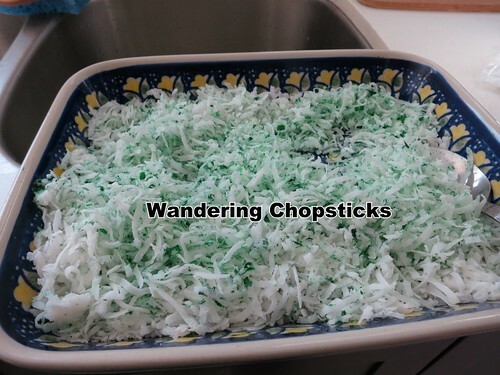 This is a quick and easy post in case you didn't know how to dye coconut flakes for topping cakes and other desserts. 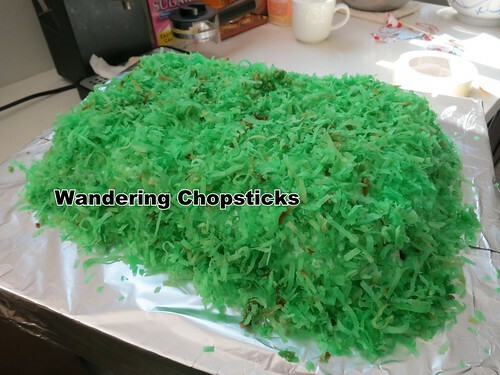 I started out by adding a few drops of food coloring to a bag of shredded coconut flakes. Mixed it up and the color barely spread. So I added a tablespoon or two of water and mixed up the coconut flakes again. Now we're getting somewhere! 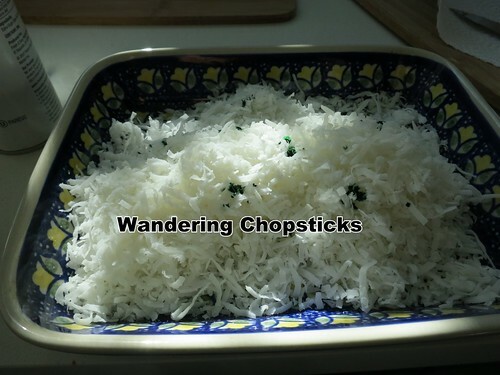 But, the coconut flakes were now too soggy. So I baked them in the oven at 350 degrees, stirring every 5 minutes or so. Just bake them at the same time as you're making the cake. Make sure to stir so the coconut flakes dry out evenly and so that nothing gets burnt. After about 20 minutes, the coconut flakes should be mostly dry. You don't have to wait for them to be completely dry. Take the coconut flakes out of the oven and let them finish cooling down and they'll dry at room temperature. Then sprinkle over cupcakes or cakes. 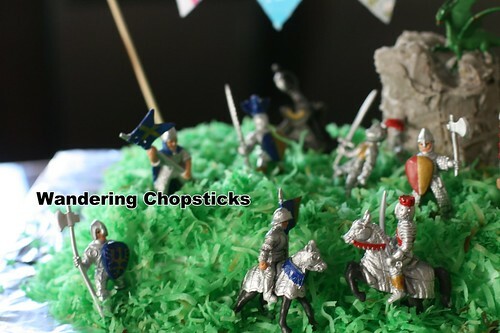 I used the coconut flakes to simulate grass, but I think this would work great for Easter cupcakes too. Add decorations to the cake if you'd like. 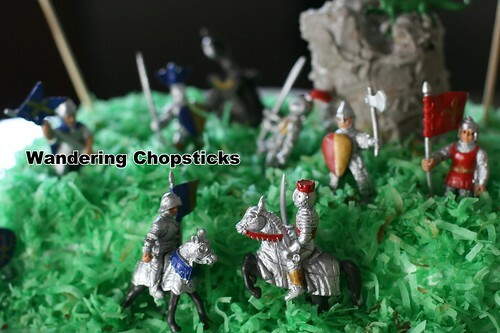 Get knights mired in the lawn. Whatever suits your fancy. 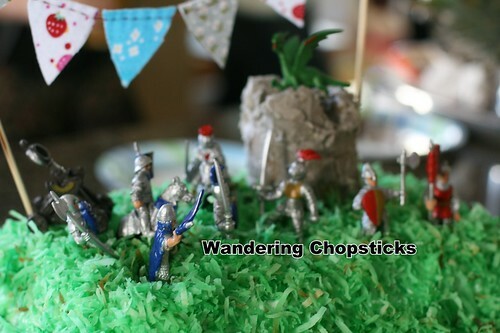 The shredded coconut as the grass for my nephew's knight-themed birthday party. 4 years ago today, Pho Super Bowl Vietnamese Cuisine - Alhambra. 5 years ago today, Hop Woo BBQ Seafood Restaurant - Alhambra (Closed). 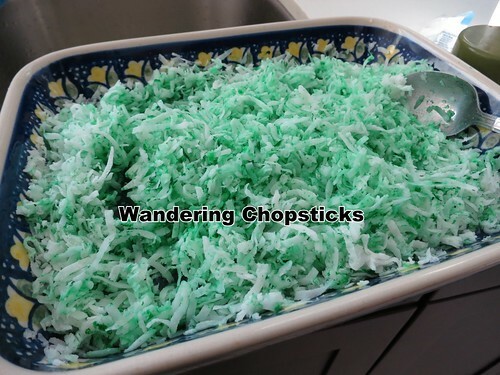 I never would have thought to color coconut flakes, but now that you've shown me how I have all kinds of decorating ideas! Great tutorial, thanks! I know. Isn't it great? 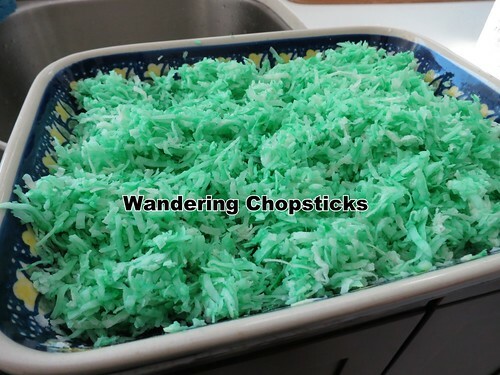 Besides Easter cupcakes, I wonder what else you can do with dyed coconut flakes?